To grasp Fibonacci extensions, first you need to know about the Fibonacci sequence, the key Fibonacci ratios, and the widespread (if unfounded) belief that financial market prices move according to these numbers. See the lesson on Fibonacci Retracements for that. Just as retracements are assumed to end at or near a Fibonacci number, the core assumption of Fibonacci extensions is that when a trend resumes, it will go as far as a Fibonacci number. 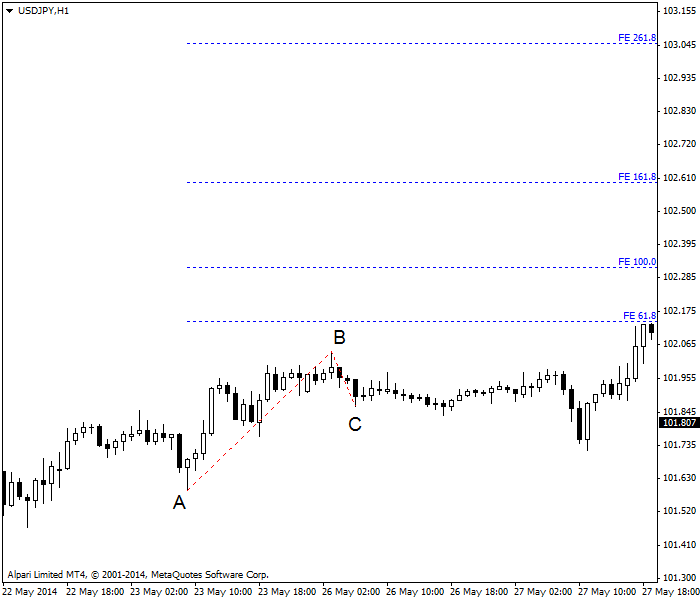 The idea is that you can use a Fibonacci extension as a price target just as you can use a Fibonacci number as a stop. Extension is also named “projection,” which reflects that the extension is an effort to identify support or resistance in the future. The default levels are 0.0%, 23.6%, 38.2%, 50.0%, 61.8%, 100.0%, 161.8%, 261.8%, and 423.6%. As noted in the previous lesson, 50% and 100% are not Fibonacci numbers but have an obvious appeal to the pattern-seeking human brain, and were adopted by W.D. Gann as key numbers. See the example chart below. Point A marks a low and Point B marks the high before a pullback. If we assume the pullback is temporary and will revolve itself back into an upmove, we want to know how far it will go. Subtract the price at Point A from the price at Point B and multiply the low at Point C by each of the various Fibonacci numbers as a percentage. The 50% level here represents 50% of the move from A to B applied to C.
The next chart shows a somewhat more successful Fibonacci extension. Again, the percentages shown after Point C are based on the move from Point A to Point B. The currency (which happens to be sterling) surpasses the 100% projection amount and then proceeds to the 161.8% amount. One criticism of Fibonacci projections is that choosing starting and ending points (Points A and B) is subjective. Note that in the chart above, after setting Point C we got a lower low. Should that invalidate the selection of Point C? In practice, it does not make much difference. The bigger criticism is that Forex market trends change for real-world reasons. See the figure below. This happens to be the USD/JPY, which halted its upmove because of geopolitical events (resulting in a rise of risk aversion), a change in the attitude toward the Japanese economy, and other known developments. 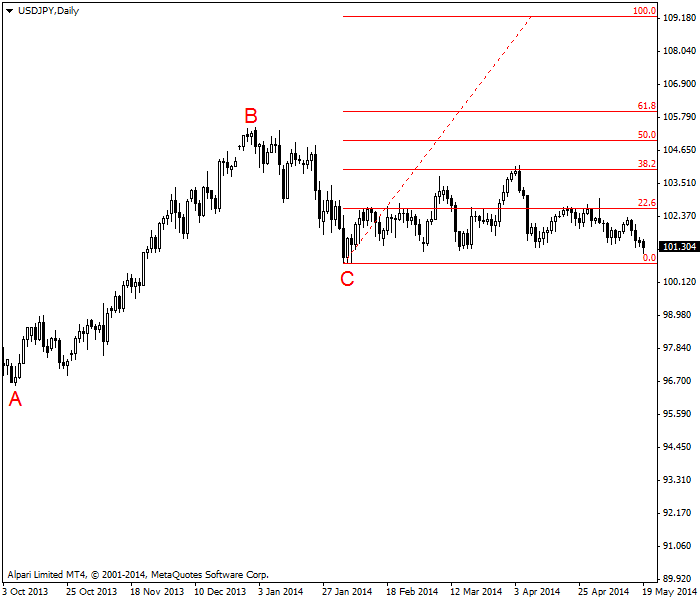 USD/JPY managed the 38% projection level but after that, got stuck in a sideways range-trading mode. And that is the biggest problem — we do get runaway moves in Forex in which Fibonacci projections might be useful, but we also get reversion to the mean and range-trading situations. You never know in advance which you are going to get. Because of these drawbacks, Fibonacci projections are of limited usefulness. 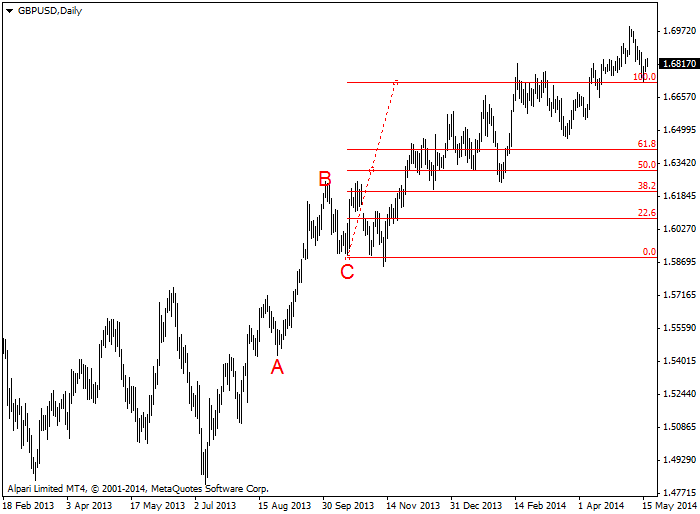 Fibonacci extensions prove to be not very helpful on USD/JPY daily chart. What about Fibonacci projections on intraday charts? Please see the next chart, which is USD/JPY on hourly timeframe. The black horizontal lines mark out Points A and B. Point C is where the blue projection lines start. This chart shows 61.8% as the first projection line, and as of the end of this data series, the price has not met it. In other words, the theory proposes that the currency should rise off Point C by 61.8%, and it comes close, but fails to reach the objective. 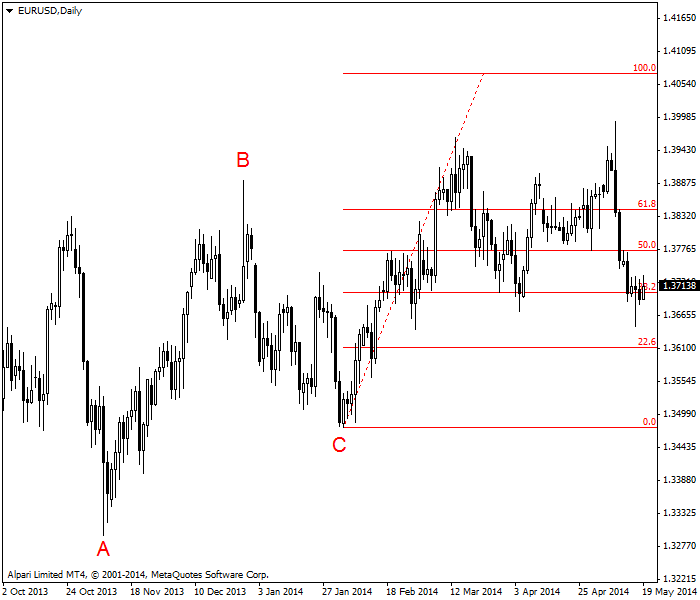 What is the difference between a Fibonacci projection and a measured move? A measured move, which was the old-school terminology in use before Fibonacci numbers captured the market’s imagination, is the assumption that a rally after a pullback will be about equal in terms of percentage gain to the original rally. Overall, it will be about the same as to slope (momentum), too. Nowadays analysts who speak about a measured move add 38% and 62% as estimates of the size as well as the older 100%. We could therefore think of Fibonacci projections as a sub-set of the measured move. a resumption of an existing move will match the previous move. you can name a new profit target using Fibonacci ratios. 2. Fibonacci numbers include 50% and 100%. 3. The Fibonacci projection is a new form of an old-school idea, the measured move.